As I’ve written before, Louisiana is as much a cuisine and way of life as a geographical place. Famous for the Acadian flavor that French trappers exiled from Canada brought to the area, the influence of Old South, Spanish settlers, backwoods ingenuity, Creole and Choctaw all make their presence known in the cuisine. I first found Louisiana through the writings of James Lee Burke, a crime fiction author of great talent- pick up Black Cherry Blues, or the more recent Crusader’s Cross for a taste- and droved down to New Orleans with a friend of mine. With how seedy a city it was then and how he portrayed it, it’s a wonder I went, and made it back. I remember a handmade sign in the French Quarter decrying the murder and corruption. But I also remember the muffaletta at the Central Grocery, the shrimp etoufee, the boiled crawfish and the pecan pie. I learned the hard way, the proper way to pronounce pecan. A pee-can is something you piss in, see. But for all James Lee Burke’s love of the Atchafalaya Basin and its people, I never made it there until my most recent trip with Firecracker, to visit her family in Baton Rouge. We went on a swamp tour of the Atchafalaya, sampled gator and catfish caught in it, stopped by the birthplace of turducken, and more. We did so much in six days that I have to write about this in several posts. The overlooked plainer sister of New Orleans, the capital city of Baton Rouge, deserves its own article; there’s quite a bit to do, and quite a lot of good things to eat in that fine city. I’ll save that for next time. This one’s all about the fun we had around the Atchafalaya Basin. Our first trip was to McGee’s Landing in Henderson. Not only do they offer swamp boat tours, but they have a nice restaurant and gift shop planted right on the water, serving up the denizens of . We snagged a sampler platter and some po’ boys that were delicately battered and fried to perfection; not greasy at all. And let me tell you, I’d had gator before, but never this good. The white tail meat is like the most tender chicken you’ve ever had texture-wise, and the flavor is like mild white fish. 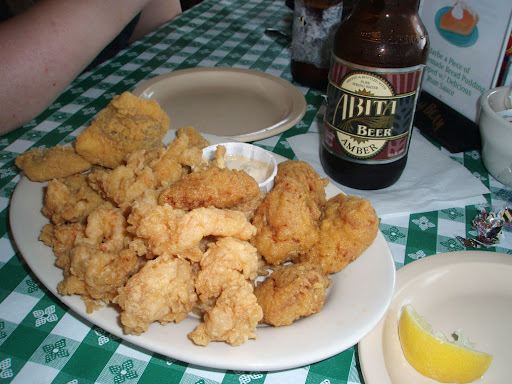 Speaking of which, you’ve never had catfish until you’ve had it down South. And Cracker Barrel don’t count. Wow, was this good. About the only delicate fish I’d compare to it in flavor and quality is Walleye at the Tavern on Grand in St. Paul. Also in the platter were shrimp and crawfish, which was thankfully in season. These little mudbugs make towers of mud along the waterways they inhabit. We found one in the ditch behind Firecracker’s family house. Of course they serve Abita beer at McGee’s, and since it was after noon somewhere we cooled off with a couple Ambers. 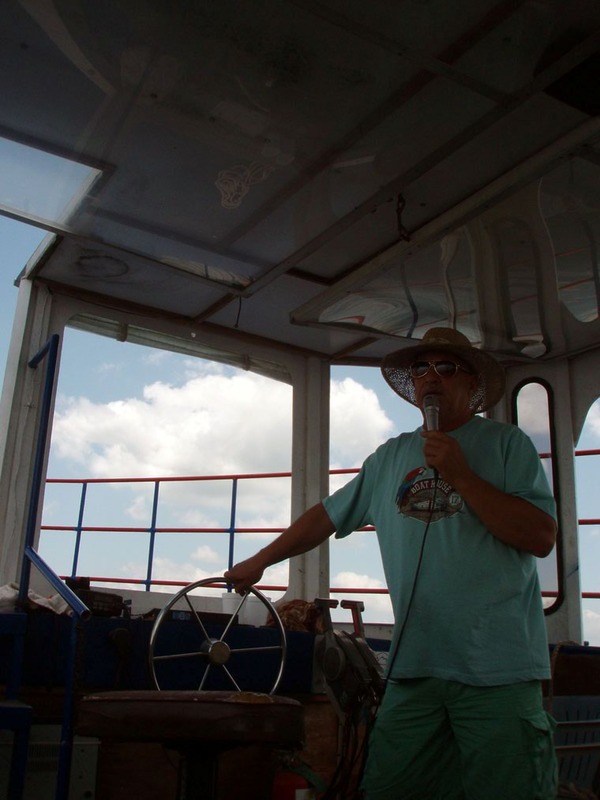 The tour itself was $20 and in a large shaded flat bottom boat, led by a Cajun tour guide whose name I can’t pronounce. He was quite entertaining- Acadian folks seem to have the same gift of gab the Irish are famed for, but in their own way. With the same gallows-humor, though. We cruised around a bit admiring cormorants, herons and pelicans, the cypress trees and Spanish moss- which was harvested for furniture stuffing back in the days- and got history lessons on everything from how the Basin was flooded, to Henry Ford started Kingsford charcoal with the remains of the wood he shipped from the basin to build Model T’s with. The most memorable part of the tour was when we squeezed up a canal to a quiet spot where the gators were used to being fed. 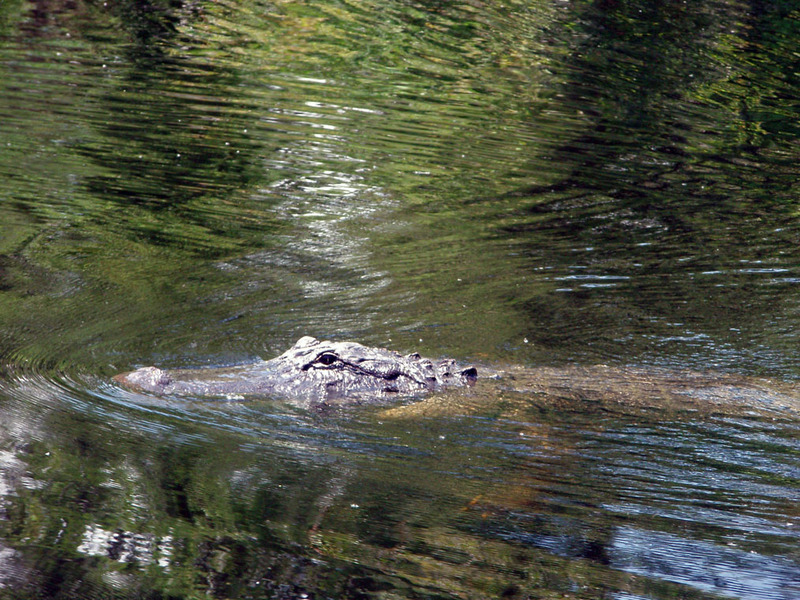 After calling them by banging a wrench on the side of the boat, he threw chunks of pork fat to “Bruce,” an 8 foot alligator, and a nameless 3 footer who came to get the scraps. 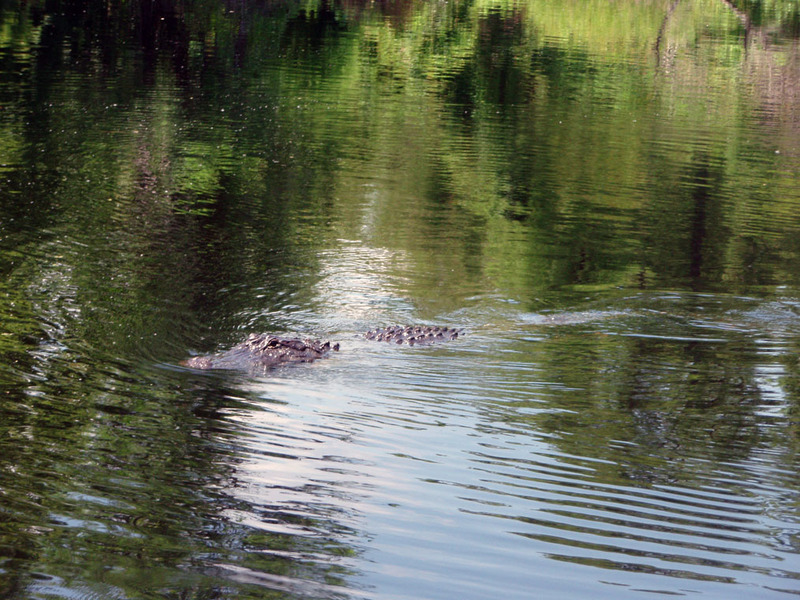 Our guide said that a 14 foot bull gator frequented the area, but it was too hot to get a lot of action that day. 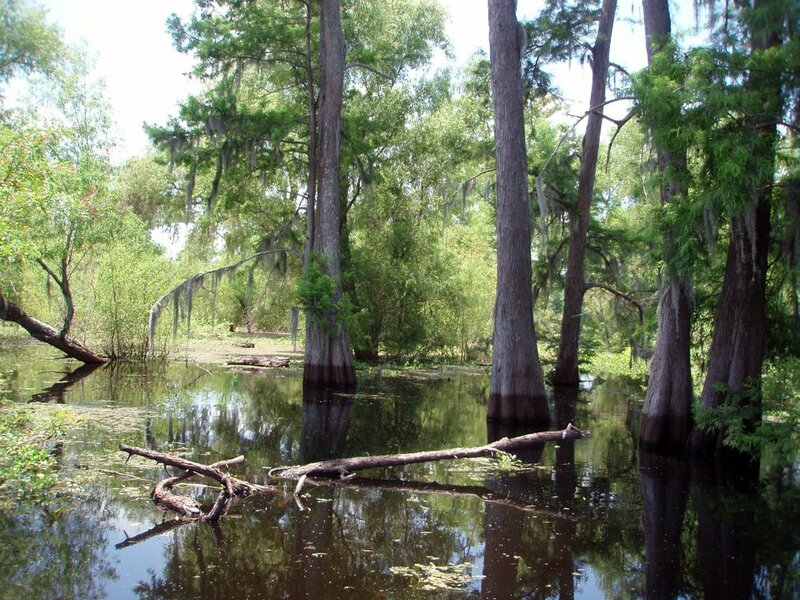 The Atchafalaya is the largest swamp in the U.S., and while we have the Great Swamp and the Meadowlands among others here in Jersey, we don’t have alligators. The mob would love to have gators around to gobble up evidence, though. 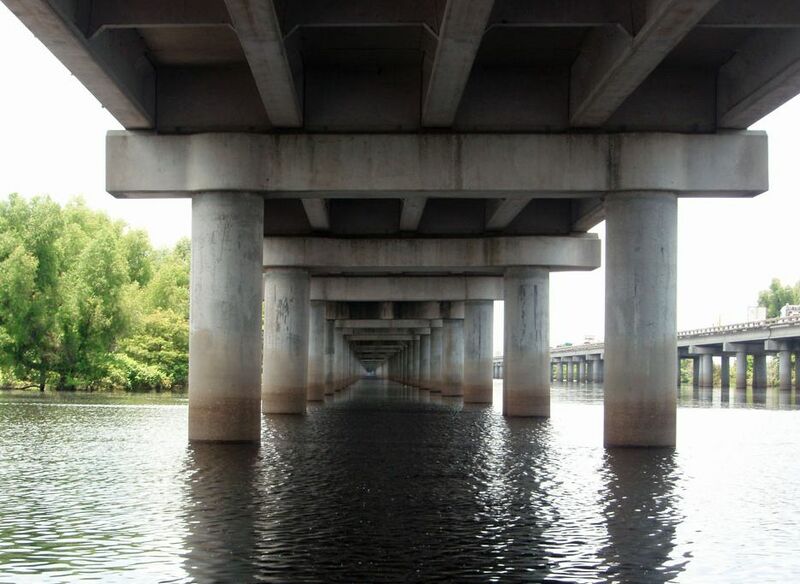 The swamp was eerily beautiful and disturbed only by the cut of I-10 above it. There were some houses out on stilts, reachable only by boat, the ultimate in solitude. Next time I visit I vow to do some fishing- big catfish, bass, and prehistoric alligator gar would all be good fun to catch. And eat. 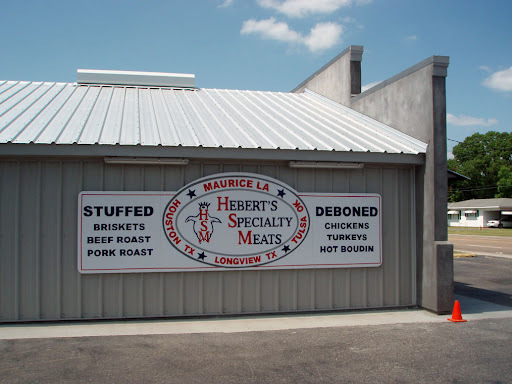 On the way back we stopped at Hebert’s Specialty Meats, which I’d seen on Andrew Zimmern’s Bizarre Foods. They make the turduckens we’ve all heard about, and while I didn’t have room for a whole turkey stuffed with a duck stuffed with a chicken, I got some turducken sausage and some boudin. They only serve lunch, and we would have missed it thanks to construction traffic on I-10, so we ate at McGee’s- and I don’t regret it one bit. Though next time I want to get a turducken plate and some boudin balls! 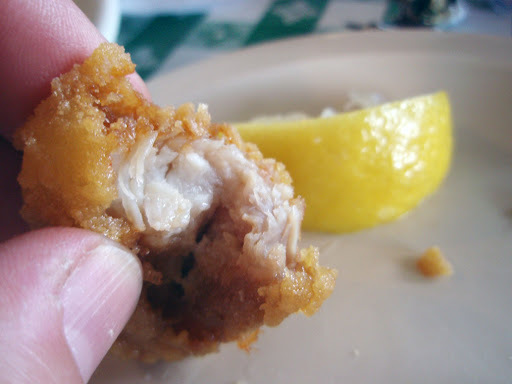 My dad grew up in southeast Texas and they used to get whole gator tails, stick 'em over a fire until they popped open and then served the tail meat out with butter. It's absolutely delicious.Dallas, unfortunately, is too far away for good Cajun food most of the time so I'm envious of your trip. That sounds delicious. I resolve to kill me a gator next time.